A vitamin is an essential nutrient that an organism needs in small qualities for its metabolism to function properly and sustain life. In other words, although they are needed in small quantities, they are essential for the proper functioning of the body organs. Vitamins are very important and when they are deficient in the body, serious illnesses could occur. Vitamins perform specific roles in the body; some vitamins perform very important roles that cannot be performed by other vitamins. Vitamins that perform specific roles are so essential that their deficiency in the body could lead to serious diseases. The essential vitamins that your body needs all the time are vitamins A, C, D, E, K, and B. However, this article focuses on a B vitamin called vitamin B12. It is worthy of note that B vitamins are water soluble and they are easily flushed out of the body. Therefore, to forestall a B12 vitamin deficiency, we need to replenish our supply of vitamin B12 every day. Also called Cobalamin, vitamin B12 is the vitamin that the body needs for energy and to make red blood cells, DNA and nerves. In other words, for the circulatory system, digestive system, muscular system, and nervous system to function at the optimum, vitamin B12 must be available and must be adequate. Vitamin B12 is naturally found in animal foods, such as poultry, eggs, milk, meat, fish, milk products, liver, and kidney. Therefore, strict vegetarians are at risk of vitamin B12 deficiency since they only consume plant foods and vitamin B12 cannot be found in plants. Vitamin B12 supplements are recommended for people who are at risk of vitamin B12 deficiency such as strict vegetarians, breastfeeding women, people who have had intestinal surgeries, and the elderly. Despite the fact that some people are more at risk of vitamin B12 deficiency, it is important that you have it at the back of your mind that anyone could be at risk of vitamin B12 deficiency. It is a water-soluble vitamin and its deficiency could be hard to detect; therefore, it could be deficient in the body and one would not realize it. 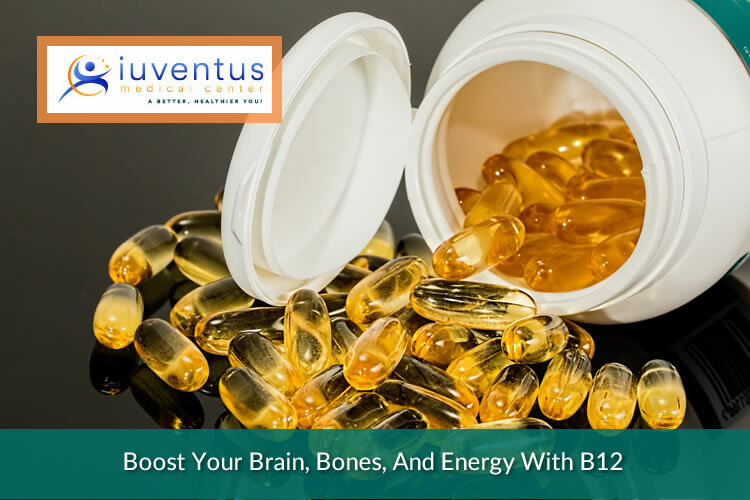 Vitamin B12 should always be adequate in the body because, in addition to the other benefits it provides to the body, it boosts the brain, bones, and energy. In other words, if you desire an energy and memory boost for performing your daily activities, make sure your body is juiced up with adequate vitamin B12.